So multiplication by roughly corresponds to rotation by angle . 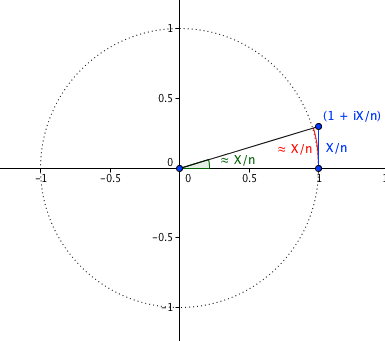 Multiplication by , which is multiplication by n times, roughly corresponds to rotation by angle . As , “roughly” becomes exact. Image generated from Python-generated SVG files; code available if anyone wants. or whatever it is that you want. Making this a Greasemonkey/Stylish/whatever extension is left for others; I just want something quick to fix this annoyance. Monospaced is fine for code, but typical monospaced fonts lack so many non-ASCII characters that all the glyph substitution makes it really ugly here. Edit: Looking around two days later, you can see complaints (I guess… I haven’t read them) here, here, here, etc., and the userscript here.